Nintendo has just announced that they are bringing Mario and Zelda to Nintendo Labo VR on April 25. 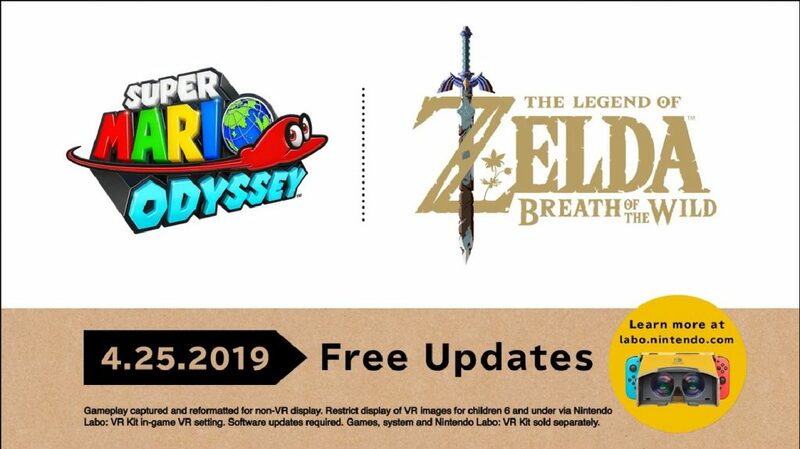 Super Mario Odyssey and Zelda: Breath of the Wild for Nintendo Switch will receive free updates that will add a VR option. For Super Mario Odyssey, there will be 3 new mini-missions for VR. For Zelda you’ll be able to play the game in VR in third person view. Given the Nintendo Switch’s limited specs (including a 720p screen), I’m setting my expectations pretty low. Nonetheless, it’s encouraging to see that Nintendo is putting more effort into VR, which I hope will increase awareness of VR and 360 among consumers. Perhaps this is an experiment to determine if they will support VR in their next console. Hopefully in the future they will also add a VR option for Metroid Prime. What do you think about this? Let me know in the comments! Now I am interested in getting LaboVR! I’ll wait to see what others think but the guys at GameXplain enjoyed their time with it. It is worth noting they are not into VR so I take their impressions with a grain of salt. Hey Denzel yeah it made me very curious too. But there are a lot of questions, such as how good or bad is the tracking? Is it 3D 360 or just 2d 360. I’ll post as soon as I test it!